Pass signed by Captain H.J.S. Anstruther authorising 121202 Spr Edwin Butler to go anywhere in the Calais area in order to carry out his duties. 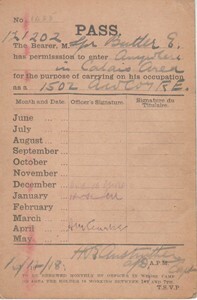 The pass was required to be signed each month between 1st and 7th, by the Commanding Officer. 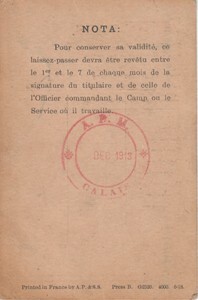 The reverse of the pass shows that is was printed in France and has the same information regarding renewing the pass each month printed in French. It has been officially date stamped ‘Dec 1913’, the reason for this is unclear. Item: Letter from Edwin Butler, addressee unknown. Item: Order to Report Letter from the Central London Recruiting Depot based at Whitehall, SW London.